Today I'm sharing a round up of easy fall outfits that you can recreate this season! The best part? All of them start with 2 of my favorite basics: jeans & t-shirts! Which look will you be recreating this season? Start with jeans & a tank. Add neutral finishing touches - a suede jacket, sunglasses, handbag & booties. Start with jeans + a long sleeved tee. Load up on girly, fall accessories: a printed bag, a felt hat, a cozy scarf & booties. Start with jeans & a long sleeved tee or sweater. Add a cozy, printed cape for the epitome of a fall outfit. Last week we loved Ashley from Le Stylo Rouge, Shauna from Lipgloss & Lace and Amy Ann from Straight A Style. You always have such great taste and style, Michelle!! Amazing fall looks! I especially love the first one, I need a jacket like that! It's still available this year & totally worth it! These outfits are so yummy! I love that first jacket especially! All of these outfits are so cute! I love the all flannel. Great fall looks. I was especially drawn to the second one with the colors of the scarf and the fun hat. 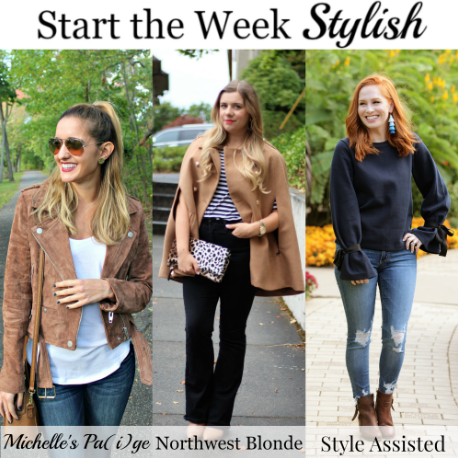 I was sharing three easy fall outfits to put together for everyday over on the blog too. Haha, great minds think alike. Have a great week! So many cute outfits for fall! Loving all the colorful scarves. Great fall outfits! Love that neutral moto jacket! I would love to recreate every look! I adore that cute striped scarf. Thanks for the link up! Would love to see how you recreate one of these! You look so cute! I love all your looks! I love the poncho one because I just got one and love wearing it! Cozy accessories become a staple in my wardrobe once the temps drop! I love all of your fall looks! I can't wait to break out my blanket scarves! Adorable fall outfits Michelle! You have the cutest collection of booties! Loving the jacket on you-- so cute! All these outfits are so perfect for fall, I am totally loving the first though! Loving your blanket scarves! But that suede jacket at the first look is so gorgeous!